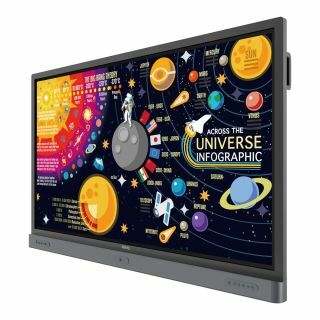 The What: BenQ has added to its Premium RP Series of interactive flat panels (IFPs) with voice control powered by AWS. Directly integrating AWS with BenQ's Saffi voice-assistant technology, the RP Series IFPs use a voice-enabled remote that is designed to simplify instruction tasks and introduce more flexibility in the classroom. The What Else: The voice capability is available as an Amazon skill and can access the deep features of the Premium RP Series through simple voice commands. Perfectly suited for active learning classrooms, the voice-activated 4K UHD IFP lineup includes the 65-inch RP6501K, 75-inch RP7501K, and 86-inch RP8601K. A quick firmware update is available to integrate Saffi to units already out in the market. "When we introduced the RP Series IFPs, our goal was to deliver a new and powerful way for teachers to command the classrooms and to drive learning potential for students through cloud collaboration, multiuser account management, and support for campus text and video broadcasting systems," said Bob Wudeck, senior director of business, education and CinePro solutions at BenQ America Corp. "Voice control is a natural expansion of these features. For over a year, we've been working with AWS to perfect the integration of voice. With our latest update, teachers and students will enjoy a more seamless, flexible and productive experience. BenQ's Saffi IFPs are the future of smart collaboration." The new BenQ Remote offers tools to help teachers keep the classroom on task. These tools include a pointer that creates a virtual spotlight that highlights areas on the screen and brings students' focus to key content. In addition, the remote features a freeze screen function, enabling instructors to check and ensure the safety and legitimacy of content on their laptop before sending it to the screen for students to view. When combined with BenQ's EZWrite 5.0 platform, the IFPs become a hub for sharing ideas, notes, and opinions. Participants can capture images of the screen and make annotations on the screen from their devices, regardless of their location. In addition, files can be downloaded and uploaded to cloud services, such as Google Drive and Dropbox, directly from the screen without the hassle of connecting USB cables and other devices. The IFPs also come with dual pens that allow two users to write or draw simultaneously with different colors. Within Brush Mode, participants can also use a physical paintbrush to meld technology and art. With the handwriting recognition feature, the IFPs instantly convert written text, numbers, forms, and drawings into easily legible digital text without having to switch modes. The Bottom Line: With AWS built into BenQ's Saffi remote, the Premium RP Series IFPs further the line’s interactive experience and collaborative technologies. Once the Saffi skill is enabled, staff can simply access the flat panel's extensive menus via voice for easy operation. In addition, they can play specific content on the screen, change modes, and more without having to be next to the panel—saving time and making operation smoother.